Attribute: Smaller than A15 mini size LED globe bulb. 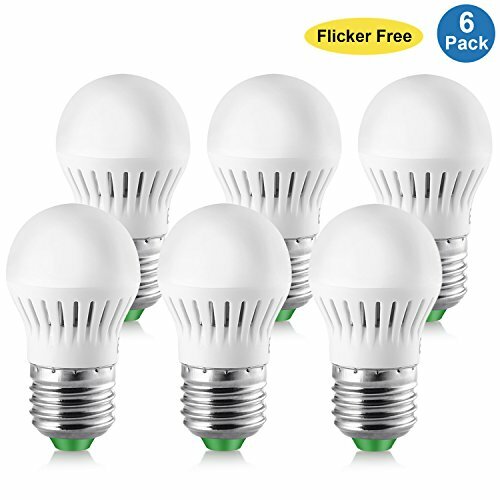 Flicker free technology: Flicker free bulb, reduce visual fatigue, protect your vision. Application: Fit to beside lamp, tabe lamp and other lamp with E26 socket in home. Premium heat sink: Built in aluminum heat sink, premium heat dissipation. High energy efficiency: 3W can replace the 25W incandescent bulb, save 85% energy costs. Long life span: 2 years warranty. Over 30000 hours life span. Flicker check: Make a vedio of the illuminated bulbs, if you see some dark stripe, it means that the bulb has flicker. Only the flicker free bulb can protect your vision. Elrigs produce flicker free LED lights. If you have any questions about this product by Elrigs, contact us by completing and submitting the form below. If you are looking for a specif part number, please include it with your message.